Looking to save a little cash this month? The Pantry Challenge 2017 may be just what you need to kickstart your savings by eating from the refrigerator and pantry. Happy New Year, Friends! I hope you had a wonderful Holiday, filled with family, friends and of course, good food. My little family has had a low key break, spent mostly enjoying activities on the home front. We did manage to schedule our traditional day trip to Grand Junction to enjoy a little shopping and lunch. The Teens enjoy having the opportunity to spend the gift cards and money they received for Christmas, and I enjoy spending relaxed time with my kiddos. Now that the calendar has turned over to welcome a new year, it’s time for one of my favorite New Year traditions – Pantry Challenge 2017. I actually look forward to this event as it forces me to do a mental reset of how I shop for groceries as well as being mindful of using the food I have on hand. Will you join me? There are many reasons for doing a Pantry Challenge. The reasons I’m proceeding this year are fairly basic. To reduce waste. The Pantry Challenge forces me to literally take stock and mindfully use the food I have on hand. It’s amazing what gets shoved in the waaaaay back recesses of the pantry and freezer. I would rather eat the food I spend my hard earned dollars on than tossing it in the garbage bin because it has expired or gone bad. No room at the inn. My 2 refrigerator/freezers and pantry are stuffed full. While perusing the food I have on hand, a strange thought occurred to me – in the event of a zombie apocalypse my family could comfortably hole up in our home for months. I’m not sure if this is a good or bad thing. To save money that I can apply towards unexpected medical bills. The Boy had an unplanned surgery in November and it has left us with substantial medical bills. I will be applying my grocery savings this month directly towards these medical bills. While it won’t pay them off in full, it will help reduce the debt. In past years, I have used my savings towards the family vacation fund or other debts we were paying down. To rein in the grocery shopping beast. I always seem to go off the rails purchasing groceries towards the end of the year. The upcoming holiday season, kids out of school and busy schedules seem to feed into the insanity. My final two grocery shops in December were off the charts – coming in just over $350! Admittedly many of those purchases were intended for special holiday meals and stocking the frig/freezer with easy to eat food for The Teens. Still….I probably could have shaved at least $50-75 off that total had I been more organized and mindful. I am most successful with a 3 week duration. Past attempts have shown the 4th week is a disaster for me. I find my interest & creativity are tapped out after 3 weeks. And, I don’t want to serve (nor does my family want to eat) questionable creations for the sake of cleaning out the pantry. The shorter duration will still allow me to accomplish my goals. Rather than doing a “no spend” Pantry Challenge, I am allowing myself a budget of $30 per week. I believe this sum will cover fresh produce, milk, bread and a few weekly treats for the Teens. I prefer not to abstain from these items for a few weeks. I’d also rather spend a little money on a few goodies for the Teens to enjoy than listen to them whine about never having anything good to eat. Moderation and keeping the peace is the key for me. I am not trying to completely empty my pantry. While I have no desire to use up food I’ve purchased at rock bottom pricing and that we eat regularly for the sake of a Pantry Challenge, I AM targeting my efforts towards the other 80% of food items in my pantry. 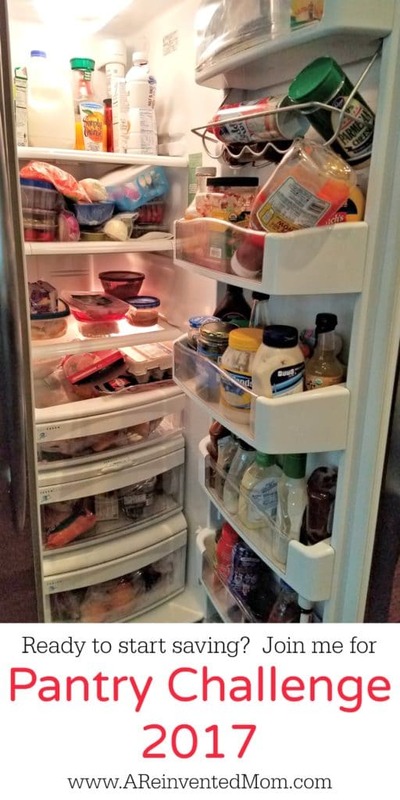 Take an inventory of the food you have on hand in your refrigerator, freezer and pantry. Doing an inventory at the beginning will give you an accurate idea of the food you have on hand, and also allows you to toss out any food you find that is past it’s expiration date. You could also use this as an opportunity to organize your stockpile. See below to download a handy Pantry Challenge Inventory Sheet. Make a meal plan. Using your handy dandy inventory as a reference, plan your meals for the week. Take into account any perishable items that need to be used first. This is the easiest way I’ve found to make the best use of food on hand. As you use up items, be sure to cross them off your inventory list. I plan on updating my progress in a weekly recap on the blog. In place of daily blog updates, I will be posting regular photos of some of the meals we are eating on Instagram and Facebook. I’d love to see what you are creating and eating, too. 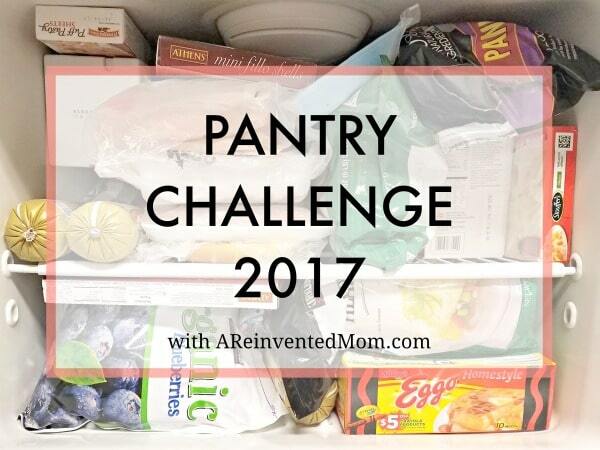 Please share your progress in the comments below, share a photo on Instagram using the hashtag #pantrychallenge (be sure to tag me @areinventedmom so we can connect) or post your updates to my Facebook page. Whatever method you use to share, let’s support each other. I am in! I had told my daughter earlier in the week we were doing a “no spend” for groceries this month and cleaning out our freezers. I love the name Pantry Challenge better, it’s less scary. We do the fix it and freeze it method of cooking (cook two, freeze one for later) and it amazing how many meals are still in my freezer this year. I’m happy you are joining the Pantry Challenge, Kim! I love the idea of doubling a recipe so you have 1 for the freezer – work once, eat twice. Keep me posted on your progress.